For today, I’ll give you 5 ways! In the Slow Cooker…Spicy Slow Cooker Chili. 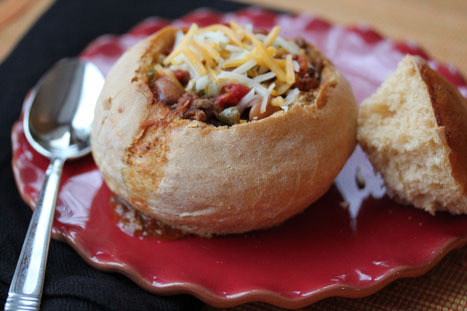 Served in a Bread Bowl…Spicy Southern Chili. What’s your favorite way to “do” chili!? We use the $5 cookbook way. delish!!!! Every time I think of chili, I think of OHIO. You are the pros right?! Absolutely! Cincinnati Chili ROCKS! White Chicken Chili is the other favorite “way” to have chili in our house. Growing up, we ALWAYS served chili over rice. Apparently we are in the minority! When my dad was growing up in the 50s, his mom served it over macaroni – probably the cheapest way to do it when you are serving 10 hungry people for ever meal. We always serve chili over rice with cheese on top. It is so yummy that way!